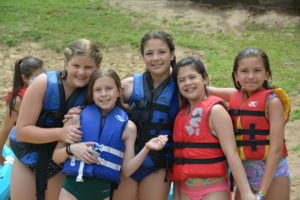 Camp Marymount offers a two-week and three-week session for girls and a one-week and two-week session for boys. Rising first graders thru rising 11th graders are eligible to be campers. 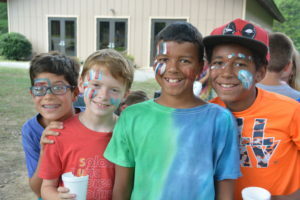 According to age and grade, campers are assigned to either Junior or Senior Camp. Junior Camp is a more structured environment. It encourages children as young as six to participate in a wide range of activities and in a cabin community. Campers develop new friendships and learn to work and play effectively as a group – all in a carefree and timeless setting. Senior Camp allows campers to be more self-sufficient. They participate in activities designed especially for them, and expand their horizons by going on a two or three day camping or canoeing excursion, and/or other offsite adventures. Female campers entering their freshman year and male campers entering eighth grade are eligible for Senior Camp. Marymount offers a boys two-week session and/ or one-week session instead of the traditional three-week boys session. Junior campers (rising first graders thru rising 7th graders) will be offered a variety of activities listed below. 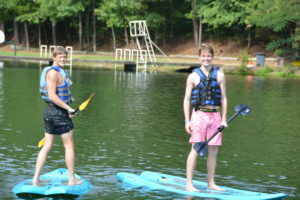 Campers will rotate through five activities each day in addition to LOPTION -lake option/ activity option. Junior campers will rotate through the camp activities at least once during the one week session. The one week option is great for a first time camper as it introduces them to the Marymount spirit/experience and also allows them to sample the variety of activities. 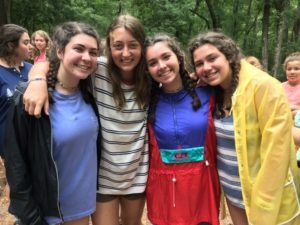 Returning Marymount campers will also enjoy the one week option as it still allows them to rotate through the traditional activities and to meet new friends. Many of our returning campers will choose to attend both the two and the one week sessions in keeping with the traditional 3 week session we have always offered. All campers will camp out/ sleep under the stars at least once a session. The one week session does not participate in our traditional camp experience of receiving award and feathers. Camp Activities: Junior campers will rotate thru the following activities and senior campers chose the activity they would like to participate in everyday! Activities include: Archery, Arts & Crafts, Nature, Wrestling, Fishing, Riflery, Horseback riding, Canoeing, Wilderness Awareness, Gardening, Water Sports, Frisbee Golf, Weird Science, Athletics, Yard Games, Tomahawk Toss, Paddle boarding, Water Trampoline Fun, and many more! This is our one week senior camp option for boys who are rising 8th graders thru 11th grade. Instead of rotating through the traditional activities, campers will enjoy two overnight trips around the Tennessee, Kentucky, and Alabama areas. Some examples of trip activities are: white water rafting, touring aquariums and museums, camping in state parks, zip lining, swimming, and many other surprises. All activity fees are included in the tuition. All trips will be done according to the safety guidelines of the American Camp Association. To learn more about our summer sessions and to see examples of our camp schedule please read our Parent Handbook.